HLV1140 is ideal for the equipment which is not HDCP compliant such as DVD player to split one HDMI signal to 2 monitors. It is only works as a splitter not a switcher. Does the source or display resolution affect the product? No, it will split any resolution (including 1080P) so long as the source does not have HDCP. Sources that do not have HDCP include DVD players. What if you play a bluray on a display that doesn’tsupport HDCP (i.e. older model LCD TVs)? If the source has HDCP (i.e. from a bluray player), however the display doesn’t not support HDCP, our limited tests indicate that it will split the source. Should this prove incorrect on certain models of displays (we can’t test every model), feel free to return the product for a full refund. At this point, we would recommenda HDMI distributor as opposed to a HDMI splitter. What if the source has HDCP and one or both the panels displaying the information has HDCP? Only output 1 (the top output) can be used. If output 2 is connected (regardless of whether the second display is running), there will be no picture on either display. 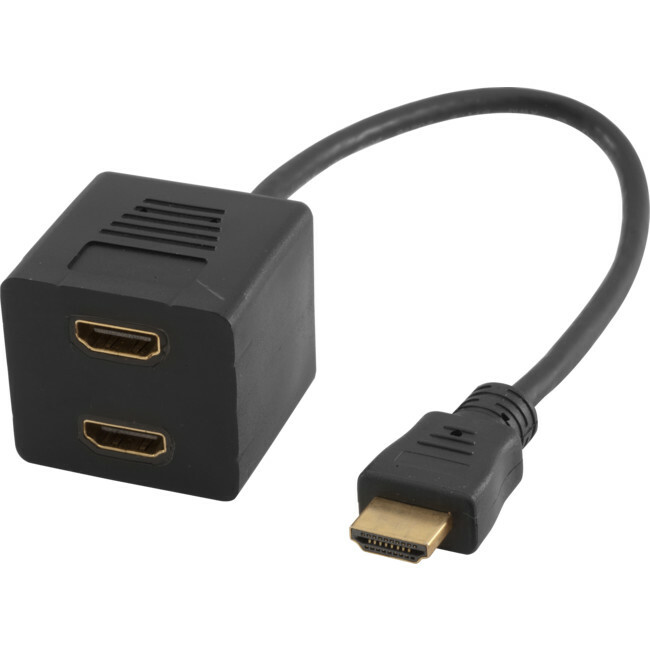 In the situation where both a source and display have HDCP, a HDMI distributor should be used.